He brought opera to the masses via his records and popular music films, and to this day, fifty years after his death at age 38, his recordings and films re-released on compact disc and DVD still are best sellers. Lanza's brilliant lyric spinto tenor became one of the most-loved voices in both popular and classical music in the 1950s. He starred in seven films and lent his voice to an eighth, and serenaded America weekly on his coast-to-coast Coca-Cola Radio Show. A number of his RCA Victor Red Seal recordings went "Gold," and there are a scarce handful of television appearances that show us how magnetic his artistry was "in person." 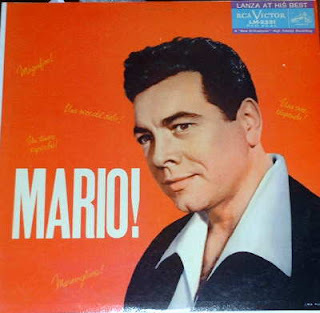 Here are my favorite Mario Lanza Lp albums with cover photo and my opinions. Note that all were original 1950's issues, with none of the compilations from later decades. "The Magic Mario" was released in 1956, Lanza's "comeback" year of sorts with his first film in four years, "Serenade," being released after several years of inactivity (aside from two television appearances in autumn, 1954) on his part due to health issues. This album contains radio airchecks from the Coke show, recorded in 1951/52, and "Magic Mario" was his third Lp in three years using this reservoir of material. It was an immensely popular album, with a most-attractive cover, showing Mario as the "King of Hearts!" 16 songs, including "Wanting You," "One Alone," "Roses of Picardy," "Parla mi d'amore, Mariu," "The Trembling of a Leaf," "When You're in Love," "None But the Lonely Heart," and "Tell Me Tonight." In Great Britain a "Magic Mario" fan club was created. This is Mario's most-famous photo, from, I believe, an M-G-M publicity shoot in 1949. The next Lp featured has a slight variation from the same "shoot." I call them dark suit/tie #1 and #2. Both photos have appeared countless times in publicity and on various RCA Victor Lanza records and CDs. "The Touch of Your Hand" from Kern/Hammerstein's "Roberta" is the dazzling opening song in this wonderful Coca-Cola Show compilation of 16 songs released in 1955. Lanza did not record between June, '53 and summer, '55, and RCA released three Coke Show (all done in '51/'52) Lps of air-checks to help get him out of tax problems. Other songs include "Day In, Day Out," "I've Got You Under My Skin," "The Desert Song," "You Are Love," "O Nights of Splendour," "Look for the Silver Lining" and "The Hills of Home," and eight more. As usual with the Coke Show airchecks, the singing is dynamic, romantic, sweet and all the things we enjoy with Lanza's voice, but sometimes a little rough around the edges. Wrong words, etc. But these were not meant to be commercially released. In the mid 1960s three more Coke Show albums were released. Flaws here and there or not, I love these albums. They comprise a good chunk of the Great American Songbook featuring melodies by Porter, Kern, Bloom, Romberg, Herbert, and others, in large, attractive orchestrations with lots of strings and brass, conducted by Ray Sinatra. Mario's first stereo recording for RCA Victor was done in December, 1958, and released in 1959, before his death. I think I read once it was done for his beloved mother, Maria, and had many of her favorite songs. Lanza is at his best for that period in his career, featuring the darker, more burnished tone of '58 and '59, still with ample power. The 12 songs on "MARIO!" are familiar Italian and Neopolitan classics such as "Funiculi, Funicula;" "Tu che nun chiagne;" "Santa Lucia luntana;" and "Passione." If I'm not mistaken he said later that "Voce e notte" was his personal favorite of any of his recordings. The cover photo is from the dressing room scene early in his 1958 film "For the First Time." Terrific sound, also, on Lp or CD. Marvelous singing! Savor with a glass of chianti or lambrusco! One of my very favorites, this album entitled "A Cavalcade of Showtunes" catches Lanza in August 1956 sounding as good as his earlier records from 1949-1953. Henri Rene gives him marvelous support in the orchestra with some unusual arrangements. Fantastic mono sound, also. Some of the best of the 12 songs are "Thine Alone;" "Yours Is My Heart Alone;" "Giannina Mia;" and "The Donkey Serenade." It's obvious Mario was in a good and expansive mood during the week he laid down these twelve tracks. Now re-issued on CD with liner notes by Lanza historian/fan Derek McGovern, it's a Must-Buy! Incidentally, the cover shot is from a "Serenade" photo shoot, probably in late 1955; it is the outfit he wears in the "Met Opera" rehearsal scene for "Otello." 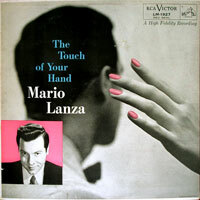 Lanza's very last album, recorded in summer of 1959, and released in 1960, after his death. Negative aspects--The sound quality varies, the orchestra is not top-notch at times, and it certainly does not qualify for the prestigious RCA Red Seal "Living Stereo" title. Lanza had been ill that spring and summer and overdubbed his part to a pre-existing soundtrack, and at times the voice sounds "heavy;" I think "The Riff Song" reflects that quality. Later, the other singers and chorus were added, in NYC! Although this technique was used a lot in later years for various complete opera sets by several major companies, it is a hodge-podge way to do things. Positive aspects--He is in sterling voice for the title song as well as "One Good Boy Gone Wrong," the sultry "Azuri's Dance" and in the quasi-operatic solo "If One Flower Grows Alone in Your Garden." In the last song his voice has the magnificent sound of the Lanza tenor of years earlier, with stunning top notes. Judith Raskin is always a joy to encounter on her too-few recordings and her voice gives much pleasure. Donald Arthur, the bass, is just ok. I expecially enjoy this stunning cover, showing the tenor as the Red Shadow in a very romantic painting, holding the heroine close to heart, with a starry desert night above. Terrific graphics. Mario was born to sing in the romantic grand manner that it takes to make this music soar and be relevant in this cynical age of ours. He believed in the music and lyrics of these old romantic musicals and operettas and thus we believed in them, also. This 1952 soundtrack to the M-G-M version of Romberg's "The Student Prince" is indispensible to any Lanza fan! This was the film from which Mario was fired after disagreements with the director and producer. The lawsuit was settled when Mario agreed to let them use his voice in these tracks for the film, and to be "sung" by actor Edmund Purdom. The songs are evergreen romantic classics of youthful love and longing passion. At age 31 Mario's sweet tenor never sounded better. "Serenade;" "Golden Days;" "The Drinking Song" and "Deep in My Heart, Dear" all evoke the springtime of romance. The film also includes three new Nic Brodsky/Paul Francis Webster songs: "Summertime in Heidelberg;" "Beloved" and a song forever associated with Lanza, "I'll Walk With God." To fill out the Lp the first use of Coke Show air-checks took place: "Romance;" "If I Loved You" and several others feature our tenor in great voice. What I wrote above applies here, again--his commitment to this genre of singing convinces all of us as listeners. I think this was his best-selling Lp, at least in the 1950s. This has just been reissued on again on CD. A must-have. And there's that famous pose, #1, again! The film "Serenade," based very loosely on the novel by James Cain, was Mario Lanza's comeback picture in 1956. 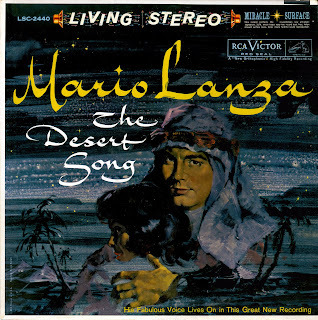 Filmed in California and Mexico in 1955, Lanza displays a somewhat weightier sound with occasional tight high notes in some selections. The best from the 12-band Lp, in my opinion, are Rossini's "La Danza," de Curtis' "Torna a Surriento," and the arias "Amor ti vieta," "Di rigori armato," "Lamento di Federico" and "O Paradiso." Schubert's "Ave Maria" gets a soupy rendition, but it is heartfelt. I prefer the version in his last film. Many Lanza fans think the long duet from Verdi's "Otello" to be his ultimate recorded operatic achievement. Mr. McGovern had to cut somewhere because of the length of the CD (with two complete Lps) and chose to do so in the "Otello" duet but the "Dio! Mio Potevi" monologue is complete. Those searching for the complete duet will find it on the Lanza Opera Arias and Duets CD. The "La Boheme" duet "O soave fanciulla" and "Il Trovatore" aria "Di quella pira" are not ML at his best; indeed, I am not terribly convinced by his version of the ever-popular "Nessun Dorma" from "Turandot," either. There is an alternate take of the latter which surfaces on YouTube that many prefer. Two songs by the "Lanza team" of Brodsky/Cahn, "Serenade" and "My Destiny," had some brief impact on the pop charts in 1956 and they are typical Lanza operatic-pop ballads, by the same team that gave him the film hits "Be My Love" and "Because You're Mine." There is an alternative "Serenade" that was not used, that I like just as well. It is on the CD release. "Serenade" is, in my opinion, one of Lanza's two best films, giving him a chance to shine dramatically as well as vocally. The CD release (shown here because I could not get a good shot of the original LP cover) improves upon the often-cavernous sound from the original Lp. This is the original early-1950s cover for this compilation of 1949-50 RCA studio recordings. Some of his best are here: "Be My Love," "My Song, My Love," "Marechiare," "a vucchella," "Because" and "For You Alone" with six more. And here's that photo, again. Reissued in 1958 as "Love Songs and a Neapolitan Serenade," it then featured a statuesque female model in flowing gown on the cover. Again, note the famous pose, #2. The title song "A Kiss" makes this compilation of 1951-52 Coke Show airchecks worth the price. Also "Night and Day," "Begin the Beguine," "Siboney," "The Night is Young and You're So Beautiful," "My Romance" and his matchless rendition of "Without a Song" and 11 others make this Lp/CD a "must!" Try to avoid "fake stereo" re-channelled versions of the Coke Show albums issued in the '60s and 70s (like this one in the photo) and seek out good copies of the original 50s Lps. Check Ebay or reliable vinyl Lp dealers. This cover is unusual in that there is no photo of the tenor. 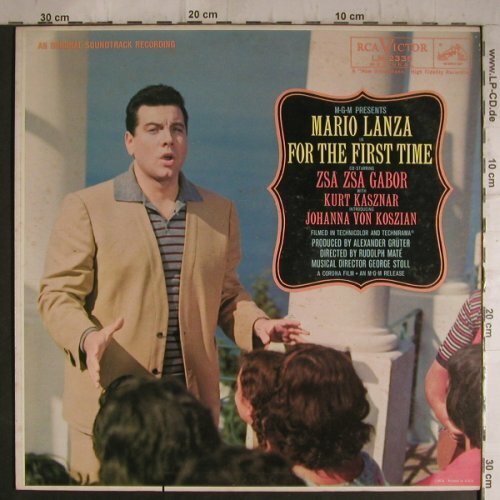 The soundtrack of Mario Lanza's last film, "For the First Time," was recorded in 1958 and released in 1959, before his untimely death in October of that year. A nice mix of opera and pops material, including his best version of "Vesti la giubba," and also the death scene from "Otello," the act II finale from "Aida" and Grieg's "I Love Thee," "O Sole Mio" and the catchy title song "Come Prima." Too bad the laughing trio from "Cosi fan tutte" that is in the film and done so well by him was not included on this soundtrack Lp. There certainly was room for it, timewise. The film features lovely scenery and Mario looks and sounds pretty top-notch in this film--his voice still sweet and lyrical when needed but definitely a darker dramatic sound was becoming evident in his late 30s. In spite of a not-so-hot calypso-rock song he does (was forced to do?) called "Pineapple Pickers" to show us how "hip" he was in '58, this is a very listenable album. I play it and the video every now and then. OK, that's it; these are my favorite Mario Lanza albums! There are numerous compilations, of course, on Lp from the '60s and '70s and now compact discs from the last twenty years. And, in some cases the CDs sound better. However, I still enjoy spinning the original old black vinyl discs and looking at the attractive graphics, photos and fonts that RCA Victor used in the 1950s on the albums of this best-selling artist.